I was thrilled to see an advertisement on one of the MTA subways for an exciting Edward Hopper exhibition going on right now at the Whitney Museum right in our very own New York City. Hopper is my artistic idol with some of his very famous paintings on display during the exhibit including my favorites, Early Sunday Morning (1930), New York Movie (1939), Office At Night (1940) and Nighthawks (1942). The greatest part of the exhibit is the fact that we as a curious public are provided the opportunity to see Hopper as a painter and a draftsman courtesy of Hoppers’ widow’s kind heart, Josephine Hopper. Hopper’s Josephine bequeathed the Whitney Museum with an unparalleled amount of Hoppers work with over 2,500 of his drawings; and we as a public should be forever grateful for this woman’s kind soul. She allowed us to see a different side to Hopper. We can see beyond the painting, live vicariously through his drawings into his inner thoughts that transformed observation into invention. 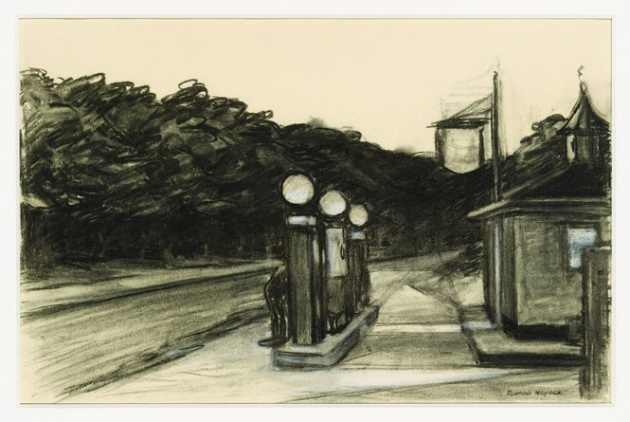 We can see through Hopper’s eyes with the sketches and various drawings provided to the museum. Very rarely do we as a public receive the opportunity to see the drafts of a famous work of art. The drafts portray a different side to the artist, a more human side than the embellished version when united with the painting. Hopper really chose his paintings carefully, and rightfully so considering the enormous impact that they’ve had on our culture over the years. 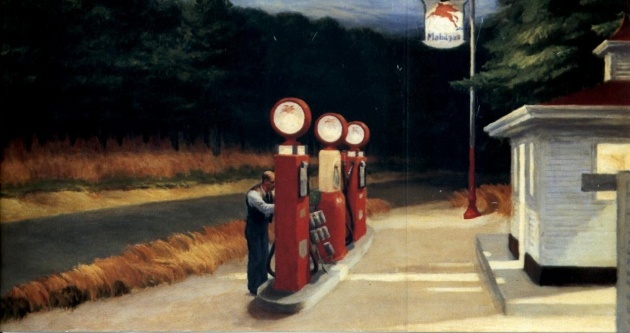 Many individuals have imitated and attempted to duplicate Hopper’s style and works over the years, depicting the strength of one artist on a public. 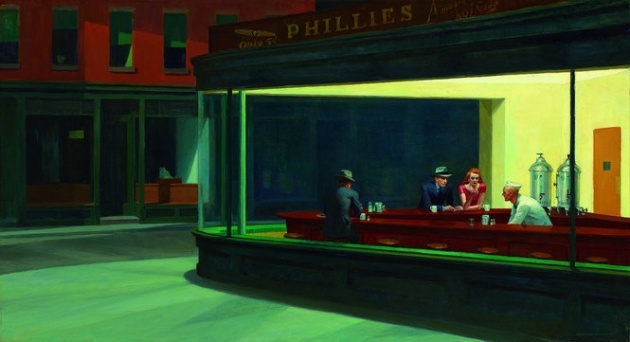 Everywhere we look, we can see a Hopper-esque mood and an artist attempting to duplicate the genius behind Nighthawks. I strongly believe we should all take the time to visit the Whitney Museum’s Edward Hopper exhibition that will run until October 6, 2013 with exclusive benefits for any members of the museum. There is a lot to be told about an artist’s passion, observations, creativity and style from simply looking at the drafts before the making of a masterpiece. 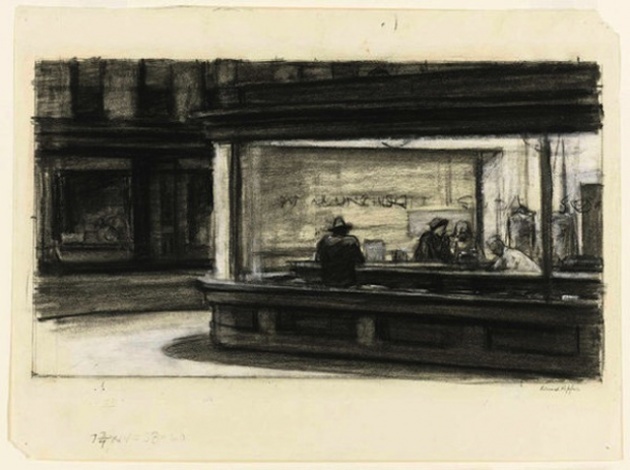 Edward Hopper is simply a master of the arts. I have this as my screen saver... love.